This was another gray, gloomy week but no snow - yet. Some is forecast for Sunday, so we'll see. I had 13 Trick or Treaters - one more than last year. I think one of the babies was now old enough to Trick or Treat. All of my visitors were accompanied by parents who were mostly male. I went and exercised every day last week. I have already noticed that I'm sleeping better. I have also noticed that I'm walking more steps than my average which is a good thing. I am so sedentary that I had many days when I didn't top 2500 steps a day. I took a look at my calendar and realized that I only had 4 review books with December release dates. I decided to read them and then backtrack to fill out the rest of my November and December calendars with books from TBR mountain. I read 29 books in October and increased my GoodReads goal from 300 to 350. Those books totalled 9254 pages Eighteen were review books, eleven were mine but only 2 counted as lowering the TBR pile since they had been lingering more than six months. I reread 5 in The Others series by Anne Bishop. I have been trying to slot in recent arrivals when I get a chance to read something I already own. I added 46 books to my LibraryThing account. Seventeen were new review books. Thirty-eight of the 46 are still unread. Almost half are review books which will be read nearer to their publication dates. I also added some of them to my calendar to read before the first of the year since I'm almost finished with 2018 releases from my review stack. The Once and Future Geek by Mari Mancusi - YA review book (Nov. 20) My review will be posted on Nov. 14. 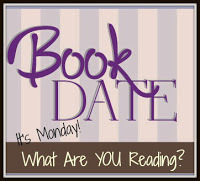 Midnight Riot by Ben Aaronovitch - TBR pile; urban fantasy/police procedural. My review will be posted on Dec. 19. Lies Sleeping by Ben Aaronovitch - Review stack (Nov. 20); urban fantasy. My review will be posted on Nov. 17. Deception with an Unlikely Earl by Victoria Alexander - Review stack (Nov. 20); historical romance. My review will be posted on Nov. 21. Fool's Moon by Diane A. S. Stuckart - Review pile (Nov. 8); cozy mystery. My review will be posted on Nov. 22. Fire and Heist by Sarah Beth Durst - YA review stack; urban fantasy. Archangel's Prophecy by Nalini Singh - Kindle copy; I reviewed the eARC. It's gloomy there too, huh...but that's awesome that you are exercising regularly. It's so key to sleeping better and being in a good mood. I try to exercise 3 times per week. I'm seeing the book Sadie everywhere. Makes me want to read it. Enjoy your reading week! Rainy and dark here too, but as you say, better for reading! Wow! 29 books. I am impressed...and your stack is full of tempting reads. We had 26 trick or treaters, mostly ages 7-10. The neighbors tell me that last year, before we moved here, they didn't have any, so I guess 26 is better than none! I always love browsing the book covers on your posts. You read such a great mix of titles. Have a great reading week! The Rivers of London series looks awesome! My fitbit has helped me be aware I need to walk more. Interestingly my steps have been up during these past few weeks after the hurricane. Probably due to clean up and having to walk around more. You always have books I like. I will be checking some of these. That's awesome on getting up and moving more :) Hope you have a great rest of the week!